Jax and Ethan are more than just cousins, they're best friends and partners-in-crime. Well, to be honest, it's more like Ethan is a partner to Jax's crimes. Jax is impulsive and always ready for an adventure, while Ethan is cautious and always armed with plenty of facts and interesting trivia. When Jax receives a mysterious package on her twelfth birthday from a great-aunt she never knew existed, a gift quickly and mysteriously confiscated by her mother, Jax is even more determined than ever to figure out why no one has ever mentioned Great-Aunt Juniper and what is inside the curious box she's given Jax for her birthday. Jax and Ethan team up with Tyler, Ethan's older computer-genius older brother, who happens to possess something the duo desperately needs: a driver's license. As the trio embarks on a road trip to figure out what secrets the box contains, they find themselves tangled in potentially dangerous adventure where their courage, wits, and teamwork might be the only things that can save them from the dark powers at play. 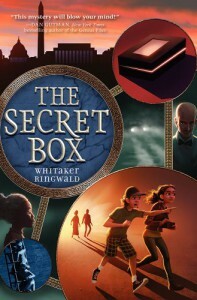 The Secret Box is the first installment in a new middle grade adventure trilogy by author Whitaker Ringwald. Readers will surely fall for the heroes of this story - Jax and Ethan - who, though very different, compliment one another perfectly. Jax's impulsiveness and irrepressible excitement moves the story along at a quick pace, while Ethan's attention to detail and penchant for reciting facts and figures grounds the story and gives readers time to process important details. I'm very curious about the Greek mythology elements of The Secret Box and the secrets regarding Jax's father. In this first book, readers are only given small amounts of information about who Jax's father is and how he ties into the big mystery surrounding Juniper and the curious artifact gifted to Jax. I'm anxiously awaiting the answers I hope to find in the second book! The Secret Box is a great beginning to what promises to be a fantastic new trilogy.